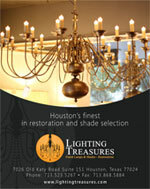 Lighting Treasures is Houston’s premier lighting source offering restoration and repair services in addition to a selection of over 2,500 lamp shades. Our in-house restoration and repair team have over 40 years combined experience in the field and will amaze you with their ability to work with all types of materials and finishes when restoring, repairing and customizing lamps. We welcome interior designers, decorators, office owners, and home owners to choose from our collection of Table Lamps, Floor Lamps, Chandeliers, Wall Sconces, and our huge assortment of Lighting and Lamp Shades.